The Little Princess Trust is a hair loss charity founded in 2006 to help young people up to the age of 24. Specifically, they provide real hair wigs to those who have lost their hair for any reason. “This is a great example of the worthwhile causes staff members choose to support on their own initiative. I’m so proud of their community-focussed attitude. In particular because it reflects tpm’s philosophy of doing all we can to support the individuals we serve. Personally, I was blown away by Helen and Paula’s selflessness. Deciding to get your hair cut from long to short can be a drastic decision”. After reading that the minimum length for hair donations was seven inches, Helen gathered her hair into pony tail and measured it. It was over seven inches. Consequently, she decided to go under the scissors for the worthy cause. 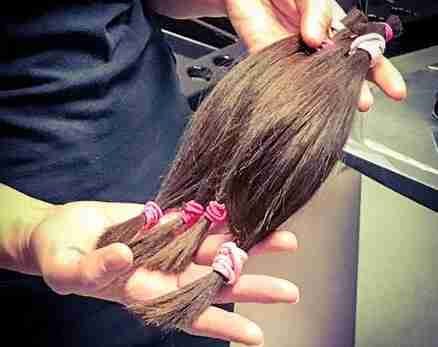 In addition to donating her hair, Helen set up a Just Giving page. As a result she has almost reached the halfway mark for the £200 she’s aiming to raise. The hair loss charity campaign got an extra boost when tpm’s receptionist Paula Ebden was inspired to have her hair cut off too. In addition to the Just Giving page, collection boxes have been available for donations at our Lime Street headquarters.